﻿”Boston” Johnny Rhode is a 66 year old contestant on Season 12 of The Biggest Loser. In one episode, near the end of the season, all of the contestants come back to run a marathon. Johnny completed a FULL marathon after losing 88 pounds, and barely being able to run/walk a single mile just seven months prior. You can see the before and after pictures on NBC’s website. As Johnny was running the marathon, he said “It’s a miracle. It’s in each of us, and all we have to do is dig it out.” And with that I put my TiVo on pause and grabbed a pen. Johnny’s quote really spoke to me because it’s a truth that stretches far beyond weight loss. It’s a truth that lies at the heart of all of our dreams, whether that be education, one’s career, relationships, being a parent. 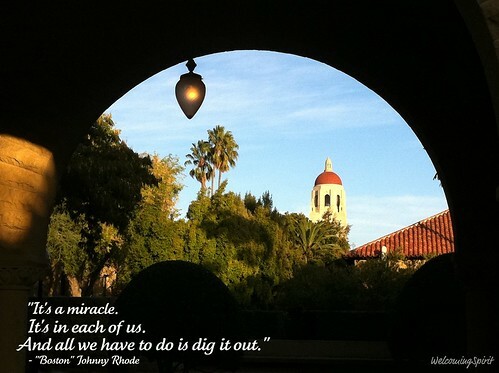 There is a nugget of our potential in each of us, and all we have to do is dig it out.